The Heydar Aliyev Center in Baku has opened its doors to the Contemporary Turkish Art Exhibition, a collection of art pieces by various Turkish artists. A solemn opening ceremony of the exhibition, organized jointly with the Turkish embassy in Baku and devoted to the 25th anniversary of diplomatic relations between Turkey and Azerbaijan, took place on September 6. Turkish Foreign Minister Mevlut Cavusoglu, Azerbaijan's Minister of Culture and Tourism Abulfaz Garayev, public and art figures attended the event. Cavusoglu, addressing the ceremony, stated that relations between Azerbaijan and Turkey are at the highest level. Stressing that the world-renowned artists and sculptors expressed their desire to participate in this exhibition, the minister added that the two states will further cooperate in the field of economy, energy and culture. Garayev, in turn, named the celebration of the 25th anniversary of diplomatic relations between Turkey and Azerbaijan as a major event. He stressed that the venue of this cultural event is the Center named after national leader Heydar Aliyev, who used to say "One nation, two states" to characterize the Azerbaijan-Turkey relations. “As proof, we see how our leaders, our peoples today have sincere attitude, trust and respect to each other. As in all spheres, our cooperation in the field of culture has been extensive. Over the past 25 years, Turkey and Azerbaijan have a unified concept in all international projects and support each other in organizing large events," said the minister. Garayev added that before the exhibition, Turkish artists have had very good meetings and master classes in the country. “Culture as a driving force will always bring people closer together,” he concluded. Later the participants got acquainted with the exhibition that features more than 60 works by 8 artists, Azertac reported. The works by famous representatives of contemporary Turkish art such as Adnan Turani (1925-2016), Devrim Erbil (1937), Yalc?n Gokcebag (1944), Sukran Pekmezci (1946), Hasan Pekmezci (1945), Zeki Serbest (1946) and Ahmet Yesil (1954) Malik Bulut's (1974) are put on display. “It is a special exhibition. Although my works are exhibited in many countries around the world, it is different to display them at the Heydar Aliyev Center in Azerbaijan. This is an expression of the bridge of friendship between Turkey and Azerbaijan, which is very important to me. So I joined the exhibition with great enthusiasm. 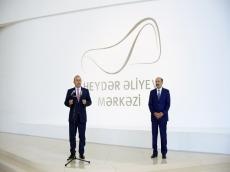 We are very glad that the exhibition opened at the Heydar Aliyev Center,” he said. Artist Sukran Pekmezci and her husband Hasan Pekmezci also noted that their participation in the exhibition is of great importance for them. They pointed out that the exhibition plays an important role in the Turkey-Azerbaijan relations. The exhibition will last till October 6.